Throughout the constellation of Orion one can see wide expanses of hydrogen clouds and dusty regions. This image is a widefield image covering approximately 6 by 4 degrees of sky between the Horsehead and Flame Nebula at the bottom left and the Great Orion Nebula in the upper right. In this image, North is to the left. Software Used Images Plus 4.5 and 5.0 for camera control, calibration, stacking, digital development, multiresolution sharpening, star size and halo reduction, smoothing and noise reduction. Photoshop CS5 used for levels and curves, high pass filter, star shrinking, screen mask invert, unsharp mask, lab color, vibrance, select color, and lens correction. Gradient Xterminator for gradient removal. Carboni Tools for additional noise reduction and smoothing. Focus Magic for focus restoration. HLVG for additional color correction. Notes After capturing the 200mm widefield data, I decided that the image would look better if I blended in my C-8 data of M42. Since the C-8 version was an HDR blend, it gave me good resolution through the entire Great Orion Nebula - a feature the 200mm data didn't have. I'm happy with the overall effect that this gave this image. 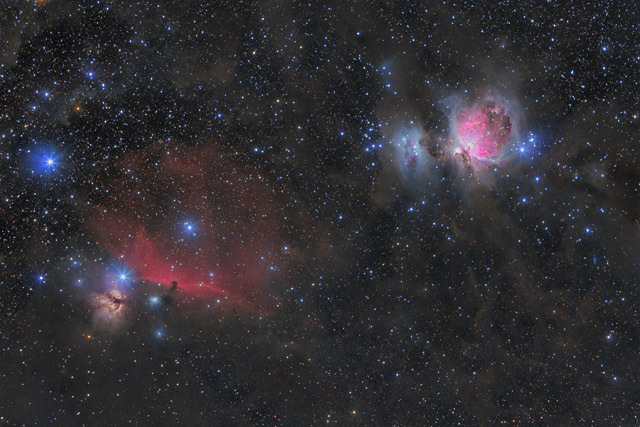 This image won first place in Astrophotogallery.org's Easy-Widefield category for August 2013.